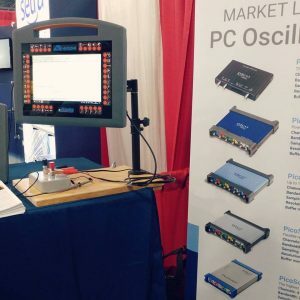 Here is the ATE-4004 mounted on a VESA monitor arm, in the PICO booth at Automotive Test Expo, in Novi Michigan. It has the standard power cable with battery-clamps connected to a “battery simulator box” with 12 volt power. This was a pre-production unit, but it demonstrated all the functionality of the final product, including out updated custom power-supplies offering longer run-time in “battery-only” mode.